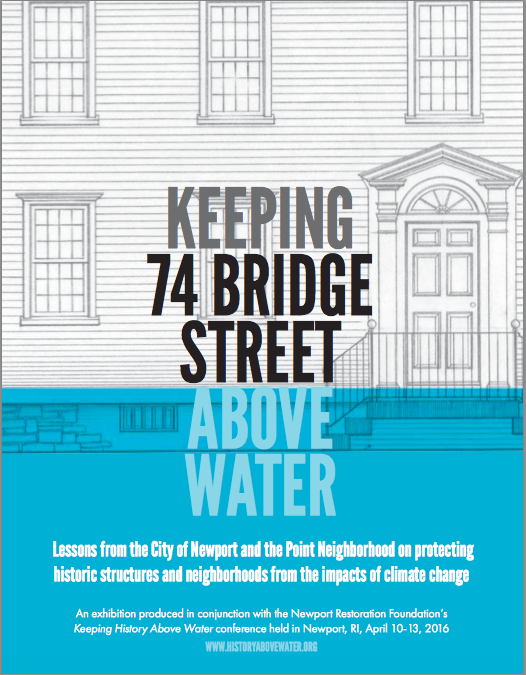 The winner of the 2017 Paul E. Buchanan Award is The Newport Restoration Foundation of Newport, RI for their 2016 conference Keeping History Above Water, exhibition, and publication Keeping 74 Bridge Street Above Water: Lessons from the City of Newport and the Point Neighborhood on protecting historic structures and neighborhoods from the impacts of climate change. The NRF was founded in 1968 by Doris Duke with the express purpose of preserving, interpreting, and maintaining landscape and objects reflecting Newport’s and Aquidneck Island’s 18th and 19th century architectural heritage. The NRF owns and operates three museums and holds extensive collection of historic Newport furniture. Since 1968 83 historic buildings, some of them rescued from demolition, have been restored or preserved. Today 68 are rented as residences and are maintained by the NRF. While the study would look closely at one historic house -74 Bridge Street (ca. 1728 with later alterations) - the overall objective was to identify a range of approaches that might protect the physical cultural heritage of the entire neighborhood in the face of the mounting environmental pressure of sea level rise and increasingly more frequent and severe precipitation events. It soon became clear that infrastructure solutions would be important adaptation strategies for historic properties in the path of sea level rise, and the study then expanded to consider convergence of site drainage needs, high tides, high water tables, and storm surges in the neighborhood. During the conference, the study's findings were presented in an exhibition, held at the case study house and memorialized in a booklet publication. The Newport Restoration Foundation worked with Union Studio Architecture and Community Design (Providence, Rhode Island) and Building Conservation Associates (Newton, Massachusetts) to undertake the case study work, and had additional assistance from architect Mohamad Farzan of NewPort Architecture (Newport, Rhode Island). Keeping History Above Water has expanded to include a variety of activities related to climate and cultural heritage across Rhode Island and around the world. A second conference will be held October 29-November 1, 2017 in Annapolis, Maryland, where the City of Annapolis is taking the lead in hosting the second edition of Keeping History Above Water.